It revolutionizes the way we create, comprehend and achieve the balance between creativity and practically. The accessibility of 3D Printers has allowed it to become a common design creation tool. It is no longer limited to big industries, as its affordability nears the paper printers we find in homes, giving individuals the ability to create near limitlessly within their means. With a 3D Printer you now have the capability of taking your ideas to life, you can customize products according to your designs, fulfilling your unique needs and requirements. Products that were unable to be manufactured due to their high level of complexity in digital design are also now made possible with 3D Printers. 3D Printing will also eliminate the need for cost and labor-intensive assembly processes previously required to achieve certain intricate design features. In industrial manufacturing, one of the most cost-intensive and time-consuming process in product development is the production of the tools. Traditionally taking weeks and even months in the producing of tools and in perfecting of details before the first prototype can be presented. This costly and long process is a thing of the past. You will now be able to produce the first prototype with hours at a mere fraction of the cost, directly on the 3d printer that fits on your desktop. 3D Printers are an integral learning and creation tool today as 3D designing, modeling and manufacturing will be fundamental to our future industries. It also spurs us to think out of the box, having a tangible result when we 3d print serving as a visual aid for students who are visual and kinesthetic learners. We can design, learn and adjust as we go along creating solutions with the 3d printer. 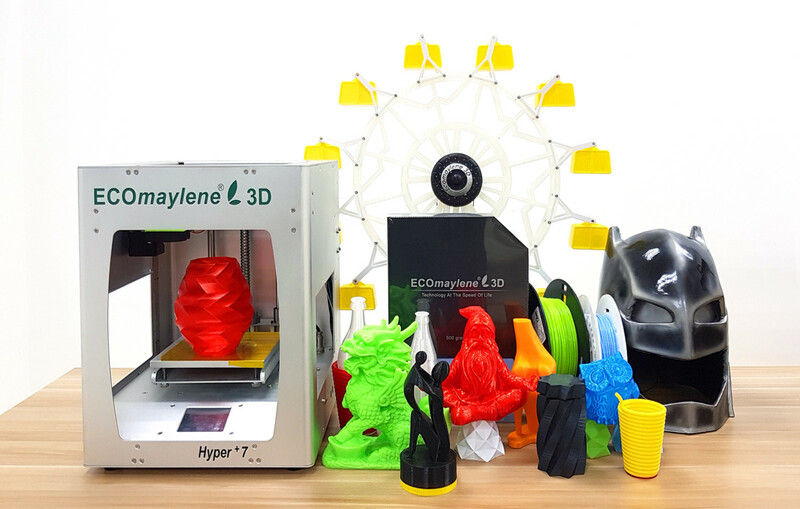 The ECOmaylene3D Hyper+7 3D Printer is the latest in the series of 3D Printers by Winrigo (S) Pte Ltd. It is a robust compact sized desktop 3D printer. It has a high print accuracy with layer resolutions of up to 100micron. With its user-friendly touch screen controls and wide material support, the Hyper+7 3D printer is ideal for prosumers, hobbyist and students alike.